In recent military exercises along the Caspian Sea, Azerbaijan demonstrated its inventory of Harop loitering munitions. This drone-adjacent category, think of it as of “unpeopled flying machines armed with sensors,” fits somewhere between cruise missile and landmine. It is often launched into an area to find a target and then collides with that target in an explosive end. While the nation remains vague about its actually utility on the battlefield, the prominence of the Harop in both military exercises and promotional videos suggests that this loitering munition is one way for the country to show off the technological sophistication and power of its military. In the next decade, we can expect both the number of loitering munition models, and the countries seeking to acquire them, to expand greatly. 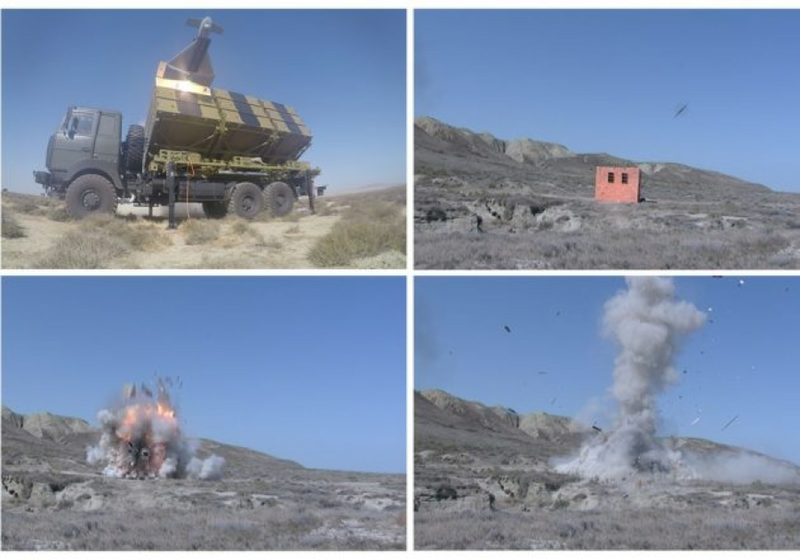 It’s possible that the Caspian exercises are not the first time Azerbaijan has used the Israeli-made Harop loitering munitions, notes Defense Blog. These instances include a sighting in April 2016 over the disputed Nagorno-Karabakh area. Armenia alleged at the time that the Harop caused casualties, though Azerbaijan denies that the weapon was used in combat. Still, the country’s hardly been shy when it comes to showing off the flying loitering munition. The Harop is featured in a music video for Azerbaijan’s border guard, and there are the newly released photos of the terminal drone in exercises. Only a handful of countries use the Harop, which has the option to land after a scouting mission if it doesn’t detect any targets in its six-hour flight. The cameras and radar-detecting sensors make it useful primarily for destroying hostile radio sites, though the payload is certainly adaptable to other targets. It is something of a prestige item, inasmuch as there is any prestige in the high-end of flying robots that go boom. The most recent pictures released show the loitering munition launched from one of nine canisters on the back of a truck, its wings folded at ignition and unfolded in the sky. The demonstration show includes the Harop flying into a target at a sharp 45 degree angle before shattering the cinderblock building. While the Harop remains the top-end of loitering munitions, it’s hardly the only entry. New contenders are smaller, infantry-portable weapons which aim to add reach and punch to smaller formations. Another Israeli design, the HERO-30, can be carried in a backpack, and features a small payload. Slovakia is developing an infantry-usable loitering munition named the Predator AX-1, and the United States uses the Switchblade drone for a similar purpose. A 2017 survey by the Center for the Study of the Drone found over 31 loitering munition programs and designs, with at least six more in development. Loitering munitions stand out as an edge case in debates around the autonomy of weapons. When piloted by a human from launch until impact, they are simple guided weapons. When launched toward a known target and then flown autonomously until impact, they are little more than sensor-rich cruise missiles. It is in the seeking of targets, the autonomous detection and then execution of objects that match a given profile that loitering munitions get closest to a lethal autonomy on their own. Landmines and naval mines, too, are built to detonate at certain threshold, like pressure from above, but landmines and naval mines do not move after targets, or move into an area and then select from the viable objects in that area which do destroy. The autonomy of the systems may be up for debate, but the use of high-end loitering munitions as a prestige weapon, and one with direct battlefield applicability, will likely further drive their development, and a greater proliferation of styles. Arms races sometimes develop a mine of their own.